Anonochat: Free anonymous call-in conference rooms. No registration. No fuss. Free anonymous call-in conference rooms. No registration. No fuss. Want another one? Click here! Anonochat is a free service that allows anyone to instantly create a temporary and disposable conference call room, which anyone may access when provided the telephone call-in number and PIN. No signup, personal information or credit card is required, and it’s 100% free to use. Software developers can also use the Anonochat functionality by accessing our API, which is also completely free. Anonochat was created and is backed by a VoIP (Voice Over Internet Protocol) provider and telecommunications carrier in the United States that has been providing services to residential and business customers since 2005. This Customer Service Terms and Conditions Agreement (“Terms and Conditions“ or “Agreement”) governs all the terms and conditions associated with a Customer's (“you," “user" or "Customer") use of the communications services and any related products or services ("Service") offered by or through the Anonochat.com and Anonochat.net websites by Callcentric, Inc. (“we," "us”, “Anonochat”, or “Callcentric”). Since using the Anonochat services are an online transaction, it is understood between Anonochat and the Customer that online acceptance of this Agreement will carry the same legal authorization as if the Customer is providing a handwritten signature of acceptance. Anonochat offers the Customer the ability to create, distribute, and join a telephone based call conferencing service and communicate with other participants of the conference, free of charge. A complete list of Anonochat services can be found on the Website (www.Anonochat.com). While Anonochat strives to be 100% available, Service Outages may occur due to Internet Outages, failure of the Public Switched Telephone Network (“PSTN”), failure of the Anonochat network or Service, or your carrier or any intermediary carrier blocking, failing, or mis-routing calls destined to the Service. Anonochat does not provide any guarantee that the service will be available at any time, and will not reimburse you for the failure or inability to use the Service. Unlawful. You shall use the Service only for lawful purposes. Anonochat reserves the right to immediately terminate your Service if, in our sole and absolute discretion, Anonochat determines that you have used the Service for an unlawful purpose. In the event of such termination, Anonochat in its sole discretion may block or prevent you from using the Service in the future. If Anonochat believes that you have used the Service for an unlawful purpose, we may forward the relevant communication and other information, including your identity, to the appropriate authorities for investigation and prosecution. You hereby consent to our forwarding of any such communications and information to these authorities. In addition, Anonochat will provide information in response to law enforcement requests, including, but not limited to, subpoenas, court orders, and requests for wire taps etc, from the government under the Patriot Act or USA Freedom Act, to protect it's rights and property and in the case where failure to disclose the information may lead to imminent harm to the Customer or others. Inappropriate Conduct. You shall not use the Service in any way that is threatening, abusive, harassing, defamatory, libelous, deceptive, fraudulent, invasive of another's privacy, or any similar behavior. Anonochat reserves the right to immediately terminate your Service if, in our sole and absolute discretion, Anonochat determines that you have used the Service in any of the aforementioned ways. In the event of such termination, Anonochat in its sole discretion may block or prevent you from using the Service in the future. If Anonochat believes that you have used the Service in any of the aforementioned ways, Anonochat may forward the relevant communication and other information, including your identity, to the appropriate authorities for investigation and prosecution. You hereby consent to our forwarding of any such communications and information to these authorities. In addition, Anonochat will provide information in response to law enforcement requests, including, but not limited to, subpoenas, court orders and requests for wire taps etc, from the government under the Patriot Act or USA Freedom Act, to protect it's rights and property and in the case where failure to disclose the information may lead to imminent harm to the Customer or others. Tampering with the Service. You shall not attempt to reverse engineer, hack, or otherwise disrupt the Service or make any use of the Service that is inconsistent with its intended purpose. Telephone numbers provided to you in connection with the Service are not provided to you exclusively, and may be used by multiple other customers. As such, you agree that you have no ownership, interest, or rights to the call-in number(s) you are provided by the Service. Call-in numbers are not eligible for Local Number Portability (“LNP”) and you may not port a call-in number away to a different service, service provider, or carrier. The Call-in number(s) provided by the Anonochat Service are located in the United States. You are solely responsible for any charges your telecommunications carrier(s) bill you for connecting to the call-in number(s). Service Distinctions. The Service is not a telecommunications service and Anonochat provides it on a best efforts basis. Important distinctions exist between telecommunications service and the Service offering that Anonochat provides. The Service is subject to different regulatory treatment than telecommunications services. This treatment may limit or otherwise affect your rights of redress before regulatory agencies. Service Availability. To access the Anonochat Services, the Customer must have access to a high-speed internet connection as well as a telephone capable of dialing a telephone number in the United States. Anonochat will not reimburse the Customer for any extra charges assessed by Customer's internet provider or telephone carrier as a result of using their services to access the Anonochat Service. Call-in number / PIN. THE CUSTOMER IS SOLELY RESPONSIBLE FOR MAINTAINING THE CONFIDENTIALITY OF ANY CALL-IN NUMBER AND PIN THEY ARE ASSIGNED. 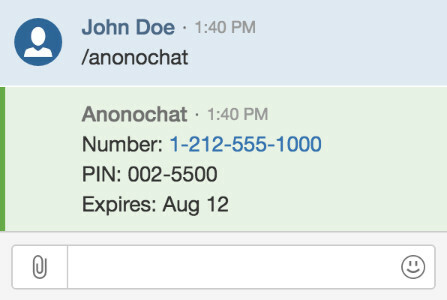 AS SUCH, ANONOCHAT CANNOT BE HELD RESPONSIBLE FOR THEFT OR FRAUDULENT USE OF THE CALL-IN NUMBER AND PIN ASSIGNED TO YOU. If a Customer suspects that their Call-in Number and/or PIN is being used in an unauthorized manner, the Customer shall be required to contact Anonochat within twenty-four (24) hours of a Customer's suspicion or awareness that unauthorized use has occurred on their Account so that the appropriate modifications can be made to prevent any further unauthorized usage. Call-in number / PIN expiration. Any Call-in number and/or PIN you are assigned by the Service may be set to expire after a specific number of days or on a specific date. Once a Call-in number and/or PIN have expired you will not be able to use them again and you must request a new Call-in number and PIN from our website. Notwithstanding the foregoing, Anonochat, expressly reserves the right to cancel any Call-in number or PIN, in its sole discretion, which has not been used for over thirty (30) consecutive days. Discontinuance of Service. Anonochat reserves the right to suspend or discontinue the Service generally, or to terminate your Service, at any time in our sole and absolute discretion. If your Service is terminated due to your breach of any provision of this Agreement, Anonochat may at its sole discretion block or prevent you from using the service in the future. Cancellation. A customer may discontinue use of the Anonochat Service at any time. Anonochat reserves the right, at its sole discretion and for any reason, to terminate this Agreement and the Customers access to the Service. Agents. Anonochat does not authorize any third-party agents or resellers to sell the Anonochat Service, electronically or through phone cards, unless specifically authorized by Anonochat. If contacted by an agent, a Customer is required to contact Anonochat to confirm that the contacting agent is licensed and authorized by Anonochat to provide these services. If a Customer fails to confirm authorization of a third-party agent or reseller of Anonochat, Customer cannot hold Anonochat liable and expressly releases Anonochat from any representation made by an unauthorized third-party agent or reseller. Access to Third-Party Vendors. Anonochat Customers may also purchase various products and services from third-party vendors by accessing those third-party vendors directly through Anonochat's Website via click throughs or hyperlinks. Anonochat is not responsible for the contents of any linked site, the products/services offered through those sites, any link to other sites contained in a linked site, or any changes or updates to such sites. Anonochat provides these links to you only as a convenience, and the inclusion of any link does not imply endorsement, guarantee or warranty (either expressed or implied) by Anonochat of the site or the products/services offered through that site. Customer Service. The Anonochat Service is provided free of charge and without any form of customer service or support. If a Customer has any questions, concerns or complaints about the Service, we can be contacted here, however we cannot guarantee you will receive a response. Limitation of Liability. ANONOCHAT SHALL NOT BE LIABLE FOR DAMAGES ARISING OUT OF OR IN ANY WAY RELATED TO THE SERVICES FURNISHED PURSUANT TO THIS AGREEMENT, INCLUDING BUT NOT LIMITED TO MISTAKES, OMISSIONS, INTERRUPTIONS, DELAYS, DEFECTS AND/OR ERRORS IN TRANSMITTING, RECEIVING, ORIGINATING, TERMINATING AND/OR DELIVERING TELEPHONE CALLS, REGARDLESS OF THE NATURE OF THE CLAIM. ANONOCHAT WILL NOT BE LIABLE UNDER ANY CIRCUMSTANCES FOR ANY SPECIAL, CONSEQUENTIAL, INCIDENTAL, AND EXEMPLARY OR PUNITIVE DAMAGES, OR LOSS OF PROFIT OR REVENUES, EVEN IF ANONOCHAT HAS BEEN SPECIFICALLY ADVISED OF THE POSSIBILITY OF SUCH DAMAGES. IN ADDITION, ANONOCHAT SHALL NOT BE LIABLE UNDER ANY CIRCUMSTANCES FOR DAMAGES ARISING OUT OF OR IN ANY WAY RELATED TO PRODUCTS, SERVICES AND/OR INFORMATION OFFERED OR PROVIDED BY THIRD-PARTY VENDORS ACCESSED THROUGH THE WEBSITE OR BY ANY OTHER MEANS. No Warranties. ANONOCHAT DOES NOT MAKE ANY WARRANTIES OF ANY KIND, EITHER EXPRESSED OR IMPLIED, WITH REGARD TO THE MERCHANTABILITY, TECHNICAL COMPATIBILITY OR FITNESS FOR A PARTICULAR PURPOSE WITH REGARD TO ANY SERVICE, PRODUCTS OR MATERIAL PROVIDED FOR PURSUANT TO THIS AGREEMENT. Force Majeure. Anonochat shall not be liable for its failure to perform its obligations under this Agreement if such failure is the result of a force majeure, including but not limited to acts of God, fire, strikes, explosions, power failure, earthquake, flood, water, labor disputes, terrorism, failure of any satellite or other connecting telecommunications facilities, or any other matter beyond the reasonable control of Anonochat. Indemnity. Customer agrees to indemnify, defend and hold Anonochat, its officers, directors, employees, agents, shareholders, licensors, suppliers and any third party information providers to the Website and Service, from and against all claims, actions, proceedings, expenses, damages and liabilities, including attorneys fees, which are the result of, or are in any way related to, Customers use of the Website, the Anonochat Service, and/or your transactions/communications with third-party vendors initiated via the Website. Exclusive Jurisdiction and Venue. Any suit involving any dispute or matter arising under this Agreement may only be brought in the United States District Court, Eastern or Southern Districts of New York located in the State of New York or the Supreme Court of the State of New York, County of New York, which shall have jurisdiction over the subject matter of the dispute or matter. Customer hereby expressly consents to the exercise of personal jurisdiction by any such court with respect to any such proceeding and waive any objection to venue or inconvenient forum and to the waiver of any right to bring, represent or join any class action of any kind in court or in arbitration or seek to consolidate or bring previously consolidated claims in Court. CUSTOMER EXPRESSLY WAIVES ANY RIGHT TO A JURY TRIAL, TO RAISE COUNTERCLAIMS OR TO ASSERT THE DEFENSE OF SETOFF IN ANY CLAIM FILED BY ANONOCHAT UNDER THE TERMS OF THIS AGREEMENT. Trademarks. All corporate names, service marks, logos, trade names, trademarks, websites and domain names of Anonochat, including but not limited to "Anonochat”, "Anonochat.com”, “Anonochat.net” (collectively "Marks") are and shall remain the exclusive property of Anonochat and nothing in this Agreement shall grant Customer the license to use such Marks without the express written permission of Anonochat. Assignment. Anonochat may assign its rights and duties under this Agreement to any party at any time without notice to the Customer. A Customer may not assign their rights and duties under this Agreement without the express written permission of Anonochat, and such permission and/or authorization shall be in the sole discretion of Anonochat. Severability. If any provision of this Agreement is held to be invalid, illegal or unenforceable, the remaining provision of this Agreement will continue in full force and effect. Integration - Entire Agreement. This Agreement, together with any written amendments or written modifications, will constitute the entire agreement between Customer and Anonochat with respect to the services provided hereunder and will supersede and replace all prior or contemporaneous understandings or agreements, written, electronic or oral, between you and Anonochat. Waiver. Anonochat's failure to insist upon or enforce strict performance of any provision of this Agreement shall not be construed as a waiver of any provision hereof nor Anonochat’s right to enforce a provision upon the Customer. Term. The term of this Agreement shall be from the Customers first use of the Website and/or Service and continuing to one (“1”) year after the last use of the Website and/or Service. Compliance with Laws. Anonochat shall comply with all applicable federal, state and local laws and/or regulations regarding the provision of the services provided for under this Agreement. Use. Customer agrees to use Anonochat's service in a lawful manner, which is consistent with the terms and conditions of this Agreement and all applicable federal, state and local laws and/or regulations. Anonochat reserves the right to immediately, and without notice, terminate, or otherwise discontinue, service to the Customer in the event it determines that a Customer has violated any such term, condition, law and/or regulation. Content. You will be responsible for any and all liability that may arise out of the content transmitted by you or to any person, whether authorized or unauthorized, using the Service (each such person, a "User"). You shall assure that your and your User's use of the Service and content comply at all times with all applicable laws, regulations and written and electronic instructions for use. Anonochat reserves the right to terminate or suspend your Services and remove you or your Users' content from the Service, if we determine, in our sole and absolute discretion, that such use or content does not conform with the requirements set forth in this Agreement or interferes with our ability to provide Services to you or others. Anonochat's action or inaction under this Section will not constitute any review or approval of you or your Users' use or content. Legality. ANONOCHAT MAKES NO WARRANTIES OR REPRESENTATIONS OF ANY KIND THAT THE SERVICES, TECHNOLOGY OR EQUIPMENT BEING PROVIDED IS LEGAL OR ALLOWED IN YOUR HOME COUNTRY, OR THE COUNTRY YOU ARE PLACING CALLS FROM. ANONOCHAT IS NOT RESPONSIBLE FOR VERIFYING LOCAL/NATIONAL LAWS AND IT IS UP TO YOU TO DETERMINE IF USING THE ANONOCHAT SERVICE IS LEGAL IN YOU COUNTRY/JURISDICTION. BY ACCEPTING SERVICE UNDER THE TERMS OF THIS AGREEMENT YOU ARE EXPRESSLY RELIEVING ANONOCHAT FROM ANY LIABILITY ARISING UNDER THE TERMS OF THIS PROVISION. Modifications/Amendments. This Agreement may be modified or amended by Anonochat at any time. Unless otherwise provided, all such modifications or amendments shall be effective immediately upon posting on the Website under Terms and Conditions. YOUR CONTINUED USE OF THE WEBSITE AND SERVICE WILL BE CONCLUSIVELY DEEMED TO BE AN EXPRESS ACKNOWLEDGEMENT AND ACCEPTANCE OF THIS AGREEMENT AND ANY MODIFICATIONS. Are you a developer? It is simple to integrate Anonochat into your own app using our API. Just send a GET http request to the URL below, and you will get back a JSON response containing a new call-in number and pin. Yes, there’s no signup or payment required at any time. Our call-in numbers are located in the US, in New York State. The cost to call these numbers is the same as any other number you would call in New York from your phone. What can I use Anonochat for? Anonymous discussions over the phone, where neither party knows the others telephone number. Give the call-in number and PIN to anyone you want to speak with over social media, IM, a forum, or any other method and you can talk in real-time over your phone with no signups, or downloads necessary. Better yet, neither party will see the others telephone number, so you can keep your identity and telephone number private. You can use Anonochat for immediate access to a call-in number and PIN for general conference call use, anytime and instantly. "Yes! The Anonochat app is available for iPhone. Our website is also optimized for mobile devices and with one tap you can get a call-in number on an Android device or iPhone. We’re working on providing an Android app in the future and we also offer Slack and HipChat integration. When using our website on an iPhone, tapping the "Click to Dial" button will call the conference number and automatically enter the PIN for you. I’m a developer, can I use Anonochat in my app? Yes! Check our our docs here. Since Anonochat requires no signup or contact information, we expire PIN codes after 30 days. At this time there is no limit to the total number of participants in one conference. 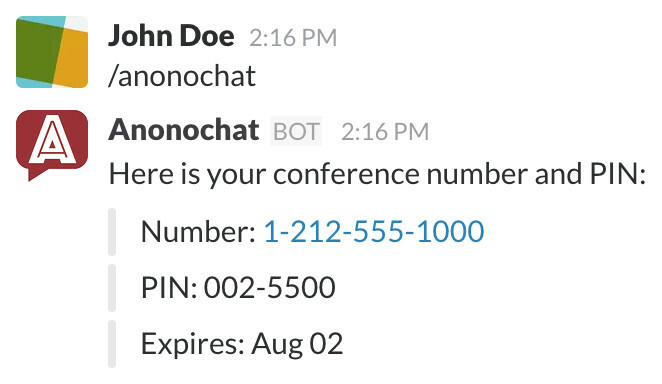 Since Anonochat is anonymous, with no signups, we can’t provide your previous conference information if you lost it, or if it expired it cannot be extended. Just click and generate a new conference call-in and PIN for immediate access to a new conference. There’s no catch. The company behind Anonochat is a telecommunications carrier in the US. If your telephone or cell phone includes unlimited minutes within the United States, the cost of the call to our call-in numbers is free and included in your monthly plan just like any other call in the US. If you pay for local / long-distance calls, then the cost to reach our call-in numbers (which are located in New York State) is the same as calling any other telephone number in NY State. We don’t provide support for Anonochat as it’s a completely free service. If you feel something is wrong, or have a specific question we’ll do our best to address it. You can Contact Us here. Questions or comments? Use our contact form to get in touch. Install the Anonochat iPhone app on your iPhone to instantly create conference rooms, share the call-in number and PIN, and instantly dial into your conference. The Anonochat app is available for free on the App Store. To add the /anonochat command to your group, simply click the button below or visit the add-on's listing in the Atlassian Marketplace.